Dr. Blecher Treats Patient with Stem Cell Therapy on "The Doctors"
Dr. Hernandez on "The Doctors"
Dr. Schopler on "First Look with Scott Cox"
Introduction: Stephen J. Snyder, M.D. Introduction: Steven A. Schopler, M.D. Introduction: William H. Mouradian, M.D. What does hip arthroscopy surgery involve? When is PRP Therapy Used for Treatment? 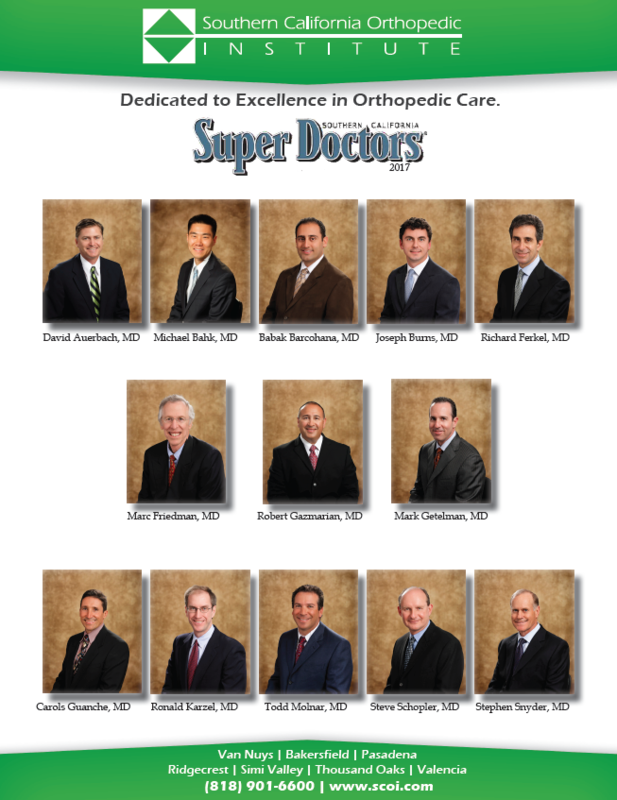 SCOI Has 13 Doctors Named 2017 Super Doctors! David Auerbach, MD, Michael Bahk, MD, Babak Barcohana, MD, Joseph Burns, MD, Richard Ferkel, MD, Marc Friedman, MD, Robert Gazmarian, MD, Mark Getelman, MD, Carlos Guanche, MD, Ronald Karzel, MD, Todd Molnar, MD, Steven Schopler, MD, and Stephen Snyder, MD from Southern California Orthopedic Institute were all chosen for this year's Los Angeles Magazine “Super Doctors"! Please join all of us here at SCOI in congratulating these 13 doctors on this wonderful achievement! Join us on May 17 for a Physical Therapist & Athletic Trainer Sports Medicine Update! At which location would you like to be seen? Is this appointment for someone under the age of 14?